Say no to drugs, say yes to life programme activities. There are numerous ways to gain agreement for a drug-free community and make your voice heard. One group, based in Adelaide, Australia, briefed local civic officials on the programme and gained permission to paint their Say No to Drugs, Say Yes to Life message as a mural on the walls of a railway station. In another city, a group sponsored their own Olympic-type games where 300 children participated in relay races, a balloon race and the painting of a giant anti-drug banner. Other groups join in civic parades, carrying large Drug-Free Marshals banners. One Say No to Drugs team in the United Kingdom sponsored a series of drug-free rock concerts and created a Say No to Drugs colouring book that they distributed to schoolchildren. Starting your own Say No to Drugs, Say Yes to Life activity begins with deciding that you want your friends, family members, students or members of your community to be drug free. By visiting this website, you have already taken this step. 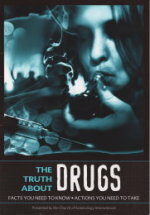 Read The Truth About Drugs and the individual drug prevention booklets in this series. Share the booklets with your friends and get them to agree to work with you. Start with a drug-free information booth, or a drug-free pledge signing event. Be creative. Whatever you decide to do, you will find wide agreement with your drug prevention actions and most everyone — mayors, police officers, teachers and shop owners — will be more than happy to help you with your events and group activities. And you will soon become aware of the best possible reward — more and more young people deciding to say no to drugs and yes to life as a result of your actions. Be sure to document your events with quality photographs or videos. These will enable you to make professional presentations and gain support for your activities. For instructional materials in how to shoot photographs and videos, write to us. Organise an information booth where people can come to ask questions and learn about the dangers of drugs. Pick a local park, shopping centre or get a stall at your town or village event – anywhere where a lot of people congregate. Obtain the necessary permission and set up a booth or table with a “Say No to Drugs, Say Yes to Life” banner on display, from which you can distribute leaflets or booklets. Hold informal lectures at the booth, using information from the drug prevention booklets, or invite former drug users to come to the booth and tell their stories; these first hand accounts of how drugs can destroy a life carry a lot of emotional impact. Visit local businesses and shops near your booth and brief them on the “Say No to Drugs, Say Yes to Life” programme; most will be more than happy to display the booklets or leaflets on their store counters or put posters in their windows. Establish a location that you can regularly come back to and staff your booth with volunteers. Word of mouth will carry. Soon people will be searching you out for answers and thanking you for warning them about drugs. Get young people and adults from all walks of life to promise to live and promote a drug-free lifestyle – by signing the “Say No to Drugs, Say Yes to Life” pledge. Set up a large pledge at your information booth and encourage passers-by to sign it. These signed pledges can then be presented to community leaders as part of events to raise public awareness; or proposals to gain support for drug education actions, events or concerts. You can also arrange for a group of school children or a delegation to visit famous athletes, entertainers and politicians to get them to sign special Drug Free Pledges. Set these up with a photo session and get each occasion covered by the media. There are two versions of the pledge, one for children and one for adults.